Jacksonville Acupuncturists use thin, sterile, stainless steel needles that do not hurt when they are inserted. There are points in the body, that when stimulated, decrease pain and promote an overall sense of well being. Jacksonville Acupuncturists are trained individuals who have completed extensive classroom and clinical hours in order to become certified to treat patients. There is no need to be in chronic pain with all of the Acupuncture Jacksonville treatments available. You will not know how acupuncture can affect your chronic pain until you try it. Although it may not work for everyone, acupuncture is free of side effects and certainly worth an attempt at dealing with your pain. Jacksonville Acupuncture has become more widely accepted in the western world. Americans are no longer accepting that prescription medications are the only treatment for conditions such as low back pain, knee pain, ankle pain, shoulder pain, leg pain, arm pain, neck pain, sciatica and arthritis. As a society we want to know what our options are. Physicians are becoming certified in acupuncture Jacksonville at increasing rates, proof that western and eastern medicine are joining forces in an effort to provide the most effective treatment possible for all patients. I want to thank you for reading my Acupuncture Jacksonville pain information. 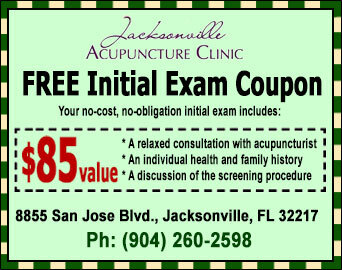 In return I would like to offer you a coupon for a FREE Initial Acupuncture Jacksonville Exam ($85 value.) This coupon is good for one initial exam and limited to one coupon per person. If you, or a loved one is in need of my services, please print out the coupon and bring it on your first visit. If you have any questions send me an e-mail Jacksonville Acupuncturist or call me at 904-260-2598. Jamie Catlett is a Board Certified and Licensed Acupuncturist in Jacksonville, FL.